If you’ve got an iPhone sitting in your pocket, you might want to get it out – Apple has just released iOS 6.1.3, an essential security update to its iPhone operating system. 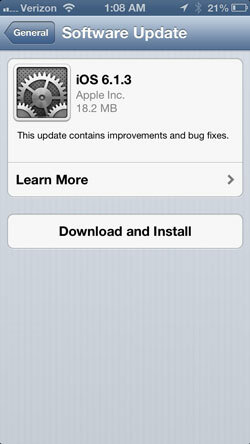 Apple’s iOS 6 has been under fire lately for its security flaws. People have found ways to glitch the software’s numerical passcode lockout, allowing a crafty and persistent snoop the ability to enter any iPhone with ease. This update immediately closes this security gap. You should make it a habit of plugging your phone in before doing any updating to prevent any unnecessary risk to your device. You may also want to wait until you are connected to a WiFi network to download the 18.2 MB update to avoid possible cell data charges.